Em Stafrace| Just a Girl with Ideas: FOLLOW THE WHITE RABBIT BLOG HOP! 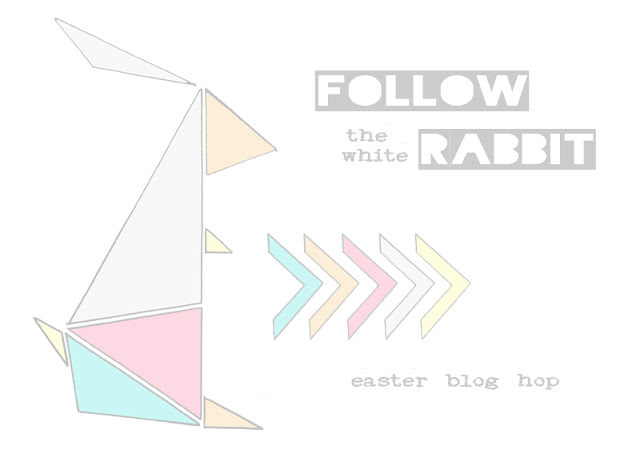 FOLLOW THE WHITE RABBIT BLOG HOP! I am so excited that you have hopped your way to my little patch of the bloggersphere and am thrilled to meet you, I hope you'll stay for a little while and check out my blog and maybe find some inspiration! Thank you for stopping by my blogwah, oh and a gentle reminder not to forget to leave a comment below so that we can tally up your entries for the fabulous raffle that was shared at the begining of the hop here. You can now head over to the extra special and talented Eila Sandberg and revel in her amazing talent. Happy Easter and happy scrapping everyone! Oh, your work is just wonderful! Fabulous creations! 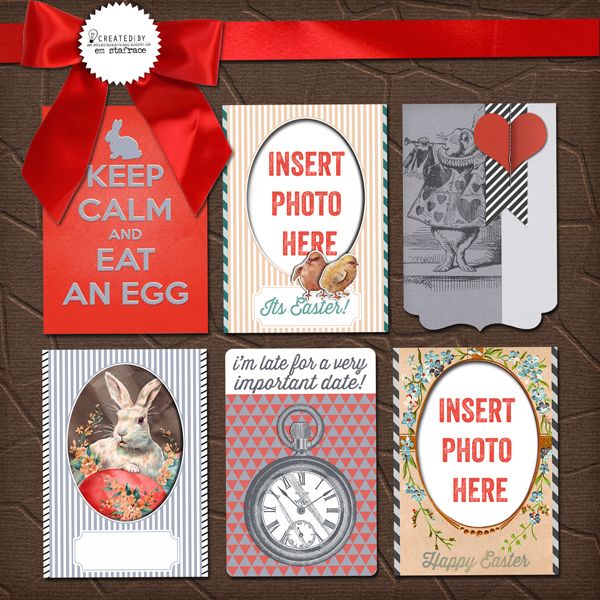 Lovely journaling cards and beautiful layout! Thank you! Lovely. Thanks for the journaling cards. This is lovely and very sureal! I love it! Fabulous lo! Love everything about it! I love the journaling cards :). Such a beautiful layout! 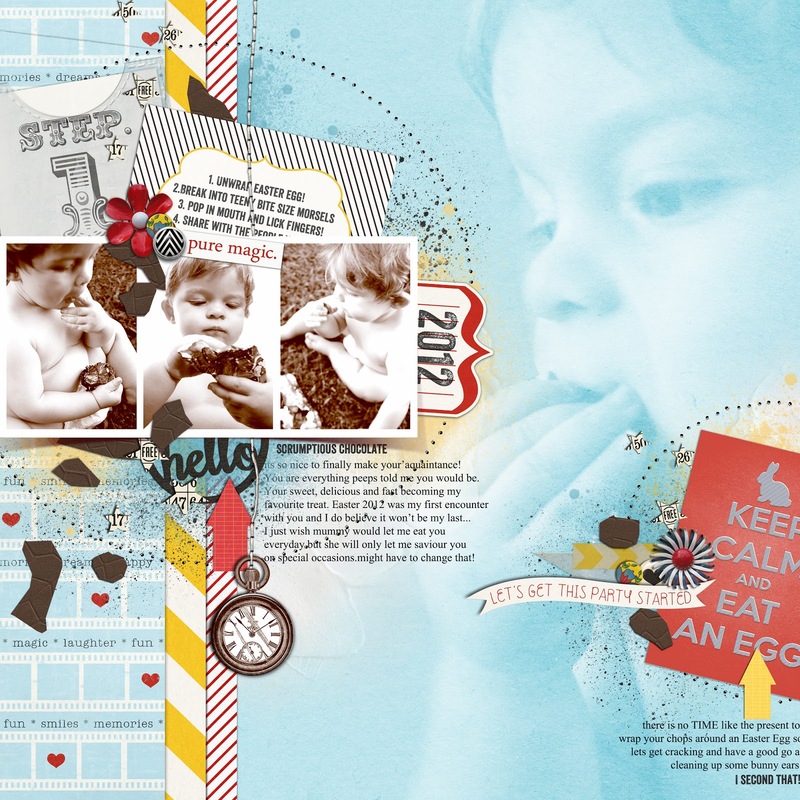 So sweet :) Great layout ... especially love the little pieces of chocolate that fell onto the page! Hi Em, Stunning, stunning lay-out! Love this layout! Here's hoping your adorable child has inherited your fabulous sense of humor. Thanks so much for the journal cards. I don't normally 'do' digi - but this is rather nice! Adorable! Love your big journal cards and story, and of course, the timepiece! Wonderful layout ... thanks for the journaling cards! thanks so much for the freebie! love it! - going to save it for next Easter :). love your page too - gorgeous, as always!! Beautiful work!! Thank you so much for such am awesome freebie. Beautiful work and cute photos! What a stunning page! I really adore the background! thanks for the digi's!! Amazing, amazing amazing! Love your style! Wonderful layout and cards! Love how you have that large photo is on the page itself, what a great detail! Beautiful LO. I like this gentle blue color as background for fantastic composition with photos. this is an amazing lo, love it. It's amazing! 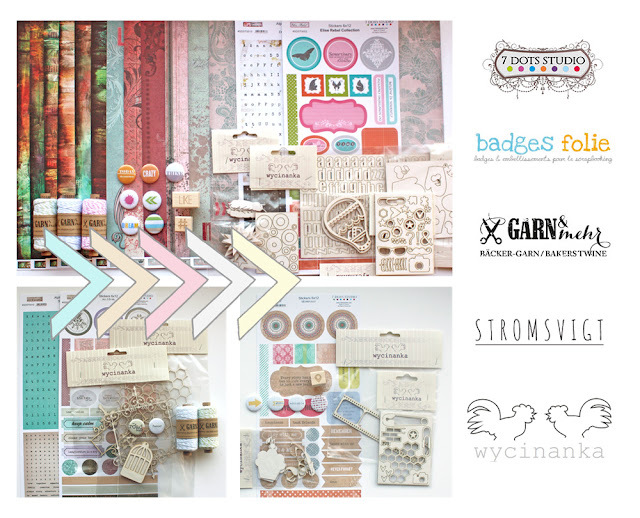 I've never thought about digital scrapbooking, but now... Thanks! Thank you for the bonus images! Lovely layout! Thanks so much for the freebie! You make me want to try digi-scrapping! Love your layout! Lovely journaling cards - thank you! A Layout which is really "full of magic"! Pretty page Love the colors and sweet pics! great use of journal cards! What a cute layout! Love the colors! What a gorgeous page! Love the big blended photo, I need to do that more on my digi layouts. It's so beautiful and so sweet!!! Thank you so much for those journal cards, they are great! The layout is so beautiful, I really like to background with a photo. Background with the pic, details and the fresness of the LO, I like! Em this is amazing. I love the design and can see it is so you. Love your layouts. Wonderful! Thanks for the cards!